Here’s a few generic programming things we use in Unity to make our lives easier. These might be useful to other people. GameManager, SteamClient, yadda yadda. You probably have a component somewhere where you only want one of them and you probably want to get access to it from everywhere for some reason. So we added SingletonComponent. You probably have a bunch of components that you want to keep a constantly updated list of too. Maybe all your enemies, or maybe all your bullets. Components can implement interfaces and now Interfaces can be grabbed using the GetComponent methods. We use this in Rust to tag components with functionality and to mark them as cullable on the client/server (which means our build system will remove that component from all prefabs when targeting specific platforms). Not many people know that you can add extended class functionality in c#. In Rust we have a problem with memory usage because of the pure number of GameObjects we have. We noticed early on that the more components the more memory. It’s also pretty common that when you have a component it’s usually identical and unchanged on every prefab, being used only to hold variables that go unchanged. So we added prefab attributes. These are like regular components except they get removed before the prefab is spawned. In this example, the sockets relate to the building system. They are snap points, they define where this building piece can attach to, and where other pieces can attach to it. 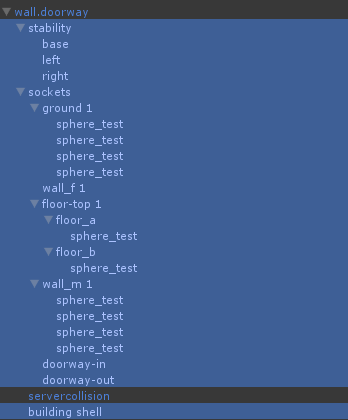 Each socket has rules, more gameobjects, more components. All of which are static, they hold no variables specific to an in-game object. So we delete them all on the first spawn of the prefab but keep them all around. Even though they’re deleted we can still access the functions and the variables. We store their local positions and rotations and can then transform them to the real in-game objects to be able to run tests etc based on their in-game locations. I like the idea of a base class for Singletons, I’ve typically just done it manually for each behavior. However, why have both a generic and simple base class? I use s couple of these patterns myself (in non Unity games). It does bother me though that you use a regular List for storing the ListComponents. That makes for O(n) removal, which is not ideal. I still have to look more into things like prefabs however. I can already see many situations where they might come in handy. Oh the singleton looks really good. I was using other way but the problem was to write all the time the same thing in other scripts which can be solved with your example. What Network-Engine did you used for Rust? UNET? Photon? Lidgren if they didn’t change it again. Great article though I happened to be wanting to know if you may create a litte regarding this subject matter? like to follow you if that might be okay. I’m certainly taking pleasure in your site plus look ahead to new revisions.